July 17, 2017. 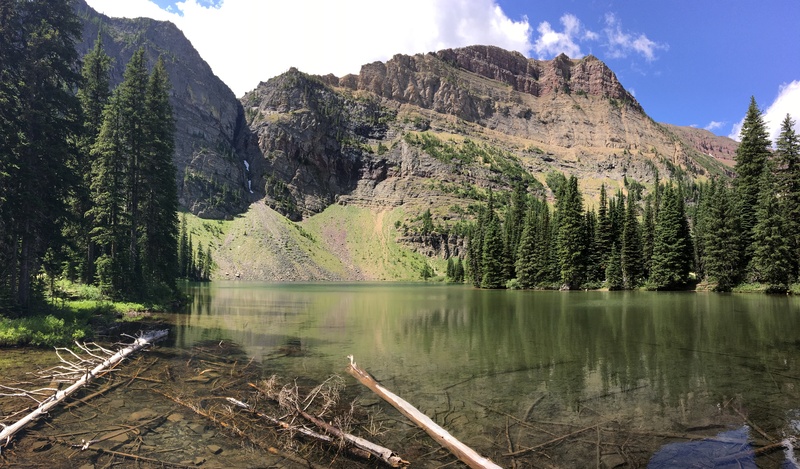 A moderately challenging hike to a lake in a hanging valley in Waterton Lakes National Park. 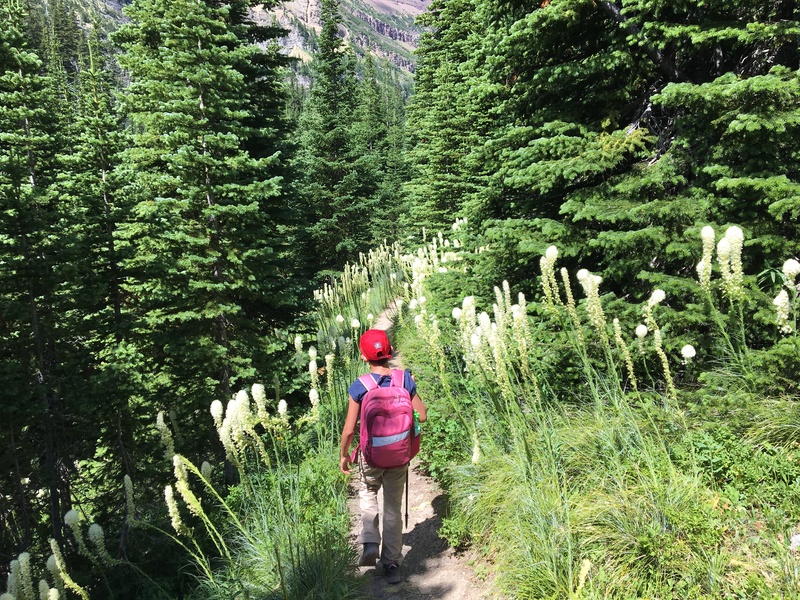 I’d been promising my 9-year-old daughter that we could do a hike together, just the two of us. Last year she made it up and around Bertha Lake with no problems, so I figured she’d be ready for more moderately-challenging hikes. 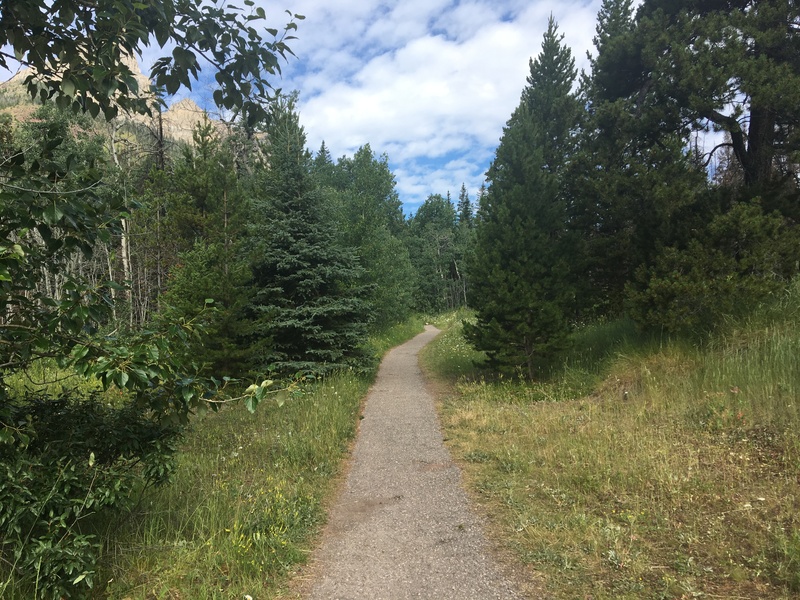 I had a free Monday after a busy weekend at work, so we seized the opportunity to get out to Waterton on a weekday. Our objective was Goat Lake. 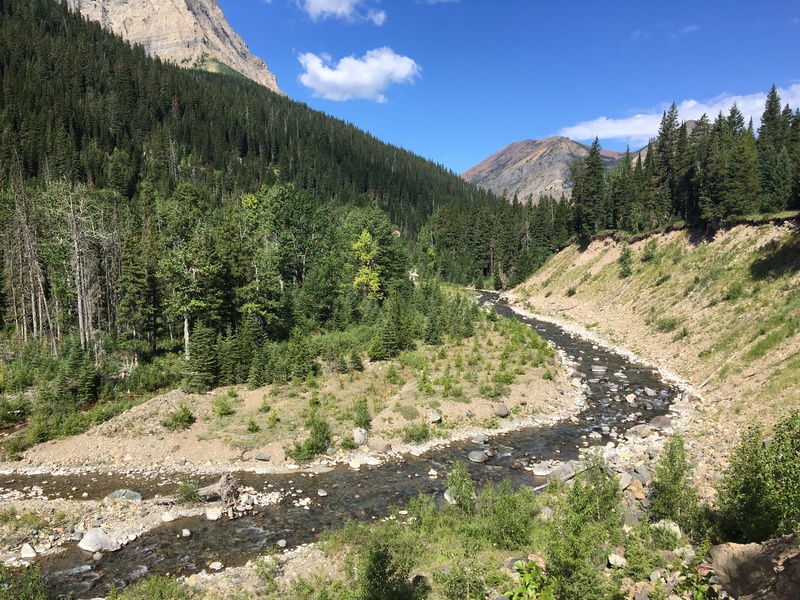 The weather in southern Alberta had been scorching hot for more than a week, but the forecast that day called for slightly cooler temperatures. Smoke rolling into Alberta from BC wildfires had found its way to Calgary and Lethbridge, but the forecast in Waterton only called for a slight haze. Goat Lake is accessed via the Blakiston trailhead, located next to the parking area at the end of the Red Rock Parkway in Waterton. 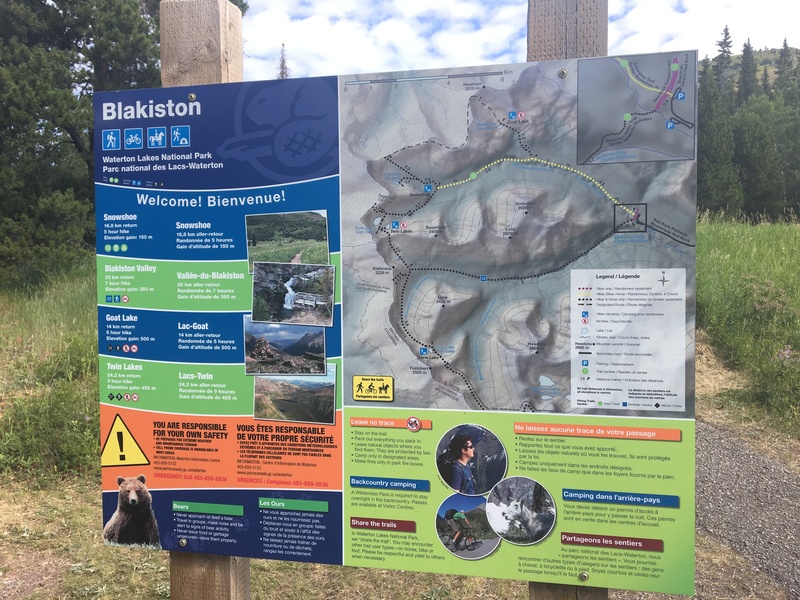 There’s a clear, colourful map at the trailhead, and there’s no chance you’ll lose your way. The initial portion of the trail follows a former forest road toward the Snowshoe campground. The first 4.8 km involve a straightforward walk through the woods. 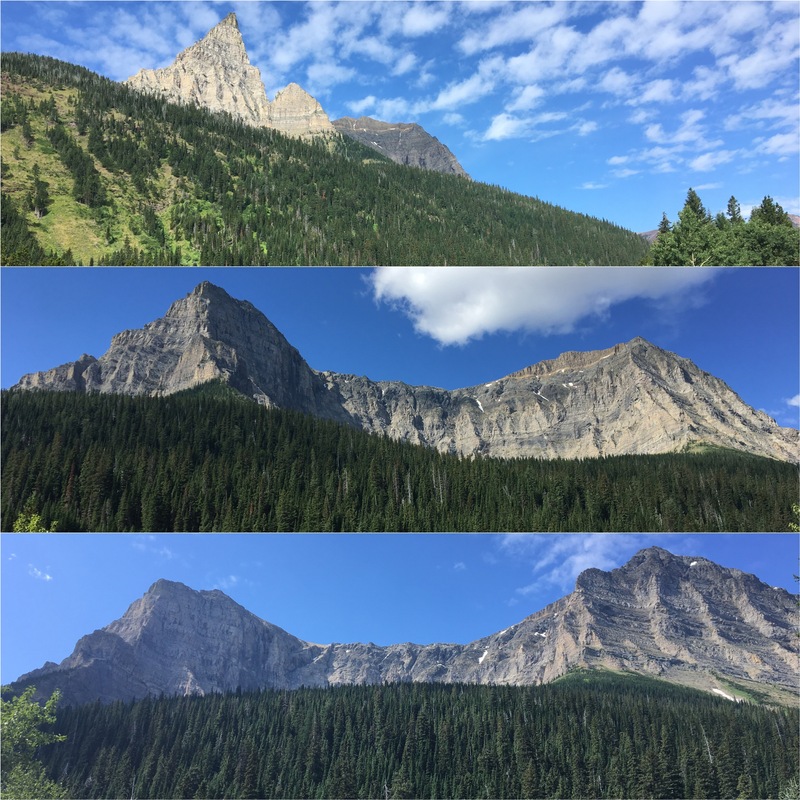 There are some views of Mount Glendowan to the north as you walk, as well as a slowly unfolding view of Anderson Peak to the south, but this part of the hike is nothing special. 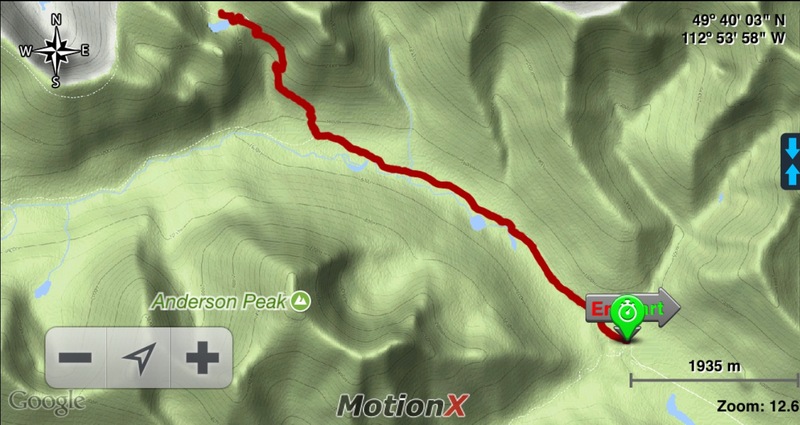 At 4.8 km there’s a sign directing you north toward Goat Lake. 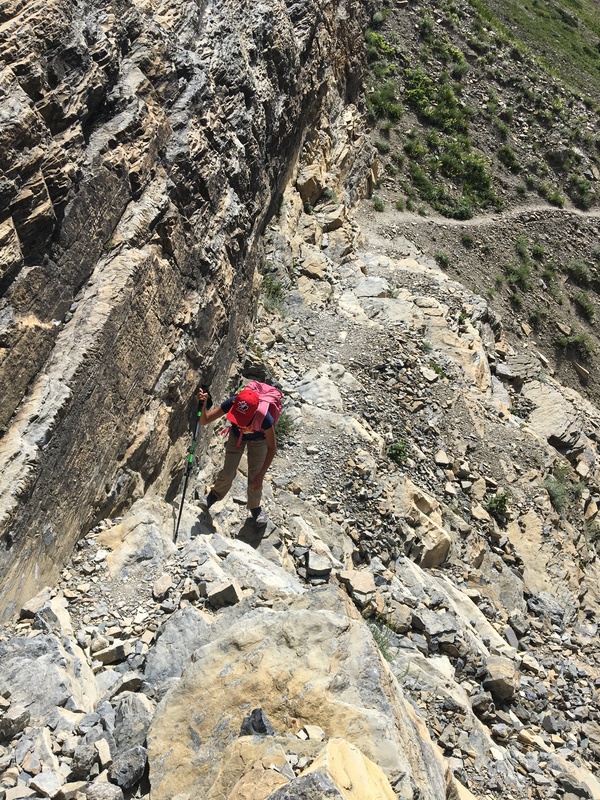 At this point the trail becomes more narrow and significantly more steep. Over the next 2.5 km the trail rises about 500m. Initially this is a trudge through trees and vegetation with little in the way of rewarding views. The eventual payoff is worth it, though. 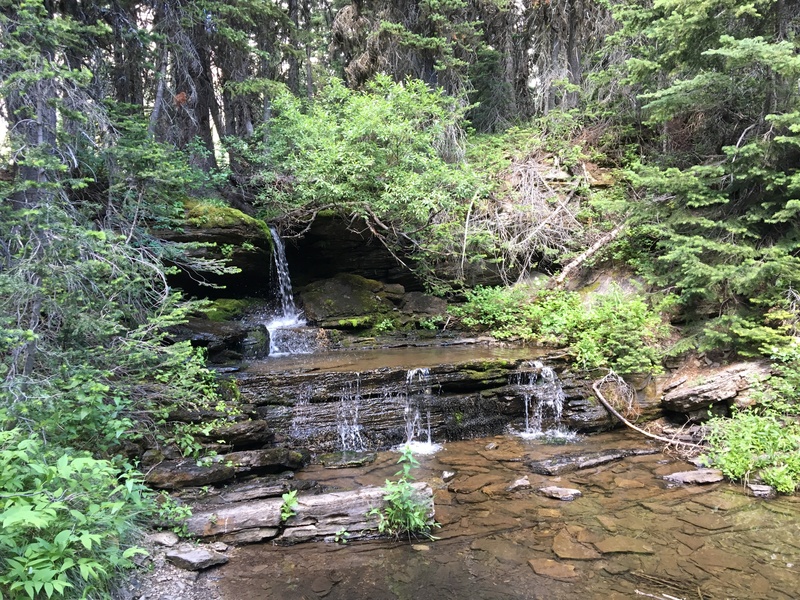 1.8km up the trail, you’ll make it out of the trees and get your first view of a broad traverse across an open rocky slope, heading towards a waterfall. After another burst of elevation gain via a switchback, you’re on the traverse. The next 650 meters are the highlight of the hike, more-so than the lake itself. 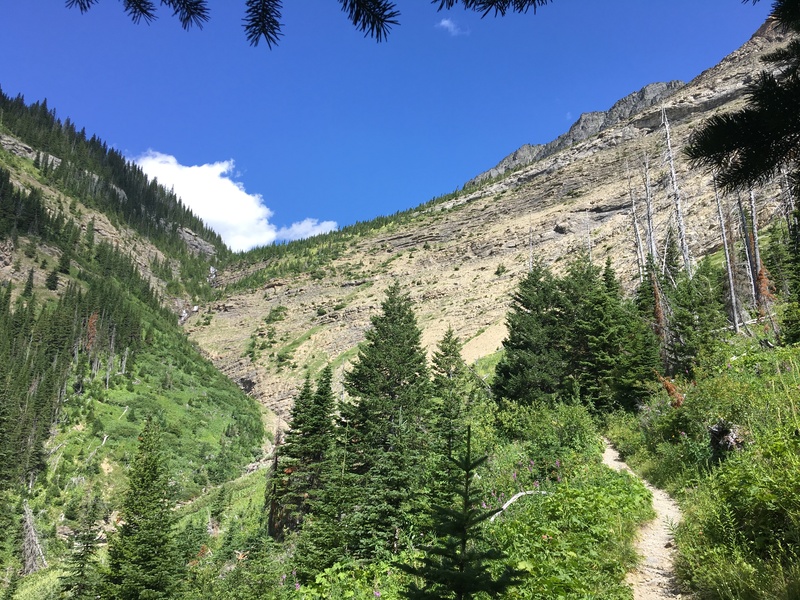 The trail is slightly narrow, and there are spots that seem a little precarious, but no scrambling skills are needed, and any reasonably confident hiker will easily make it across. This stretch can get extremely hot in the afternoon. 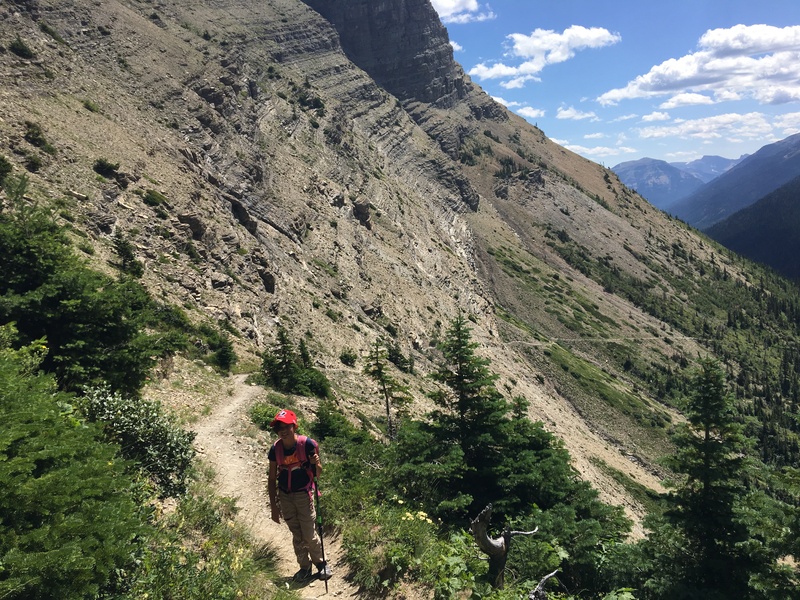 It’s a good idea to start this hike early in the day, so you’re not out on that rocky traverse when the rocks are already hot and the sun’s beating down. At the end of the traverse, there are more switchbacks to get you up to the level of the hanging valley. Just before the first of these switchbacks, there’s a little offshoot of the trail that goes behind a tree and gives a nice view of the waterfall. After the switchbacks, the trail is level and you re-enter the trees, following a lovely creek and passing small waterfalls. Beyond that, the trees open up, and you arrive at Goat Lake, with Avion Ridge looming above. 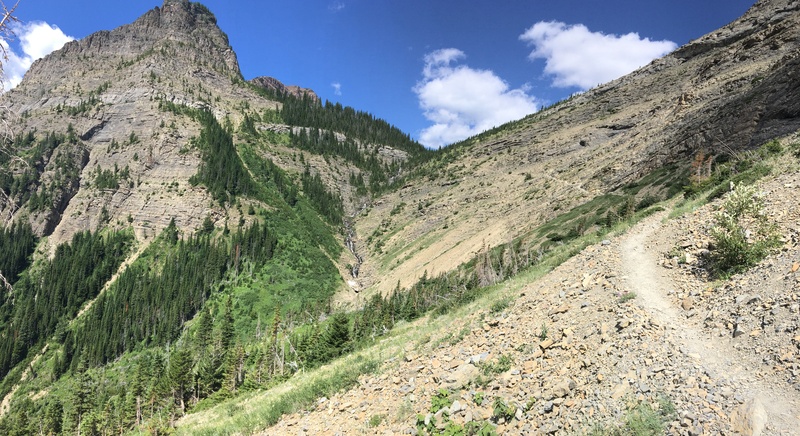 There’s a backcountry campground at the lake, and the trail continues beyond the lake toward Avion Ridge, 1.6 km and a couple hundred meters elevation-gain beyond. I went up there last year, and it’s absolutely worth it. On this occasion, though, we’d reached a good stopping point. My daughter did the climb like a champ, but it was clearly time to take a rest, eat, and make our way back down. In terms of a hike for kids, this one has a lot going for it. There are excellent “hi tech” pit toilets at the trailhead, and the toilet up at the lake is well maintained and far less scary than other outhouses-in-the-woods I’ve seen. 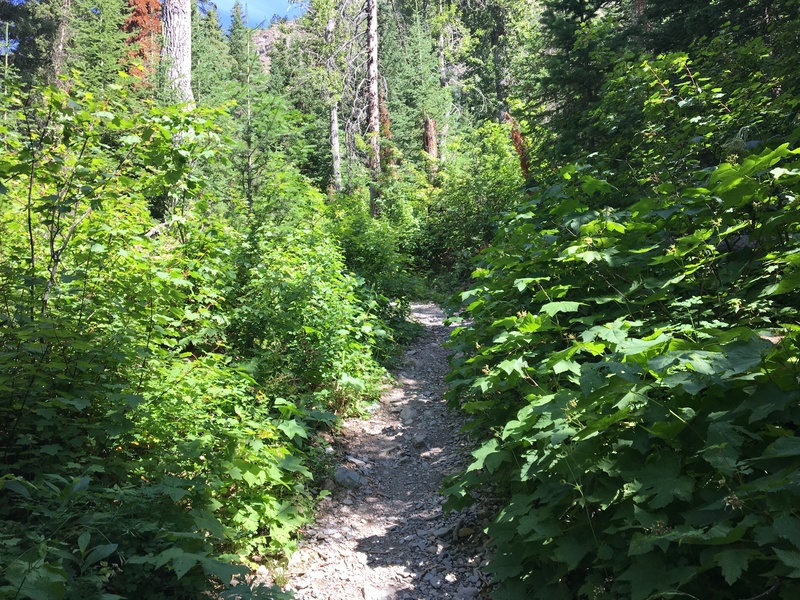 The trail is easy to follow and well maintained. The downside is simply the concentrated nature of the climb – a reasonable level of fitness is absolutely needed. This isn’t a good introductory trail. The slightly exposed nature of the traverse may also be a little nerve-wracking for some kids. My daughter and I made it up the the lake in 2h 30m. 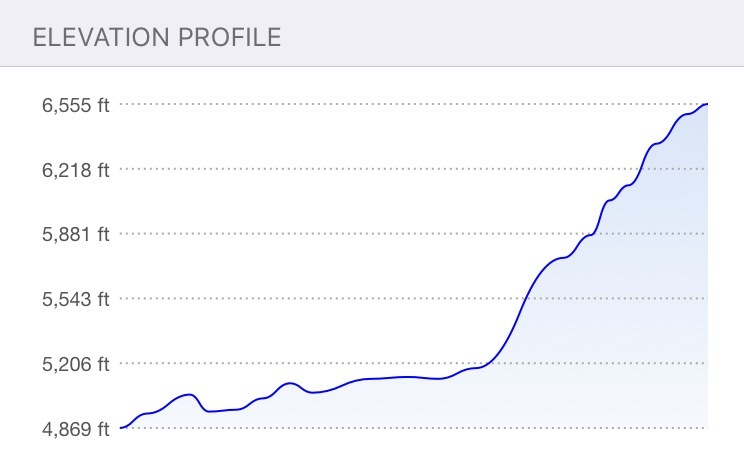 Net elevation gain was 520m. Total distance was 14.3 km. We were out and back in 4h 55m including a bit of a break at the lake. Click on the pictures below for full-sized images. There’s a colourful and very clear sign at the trailhead. The hike starts like this, through the woods on a mostly flat, wide trail. At 2km there’s a fork in the trail. The left fork looks like it may have been the original trail that got washed out. It ends abruptly and gives you this view. The route continues to the right. As you move along, you get a slowly unfolding view of Anderson Peak. 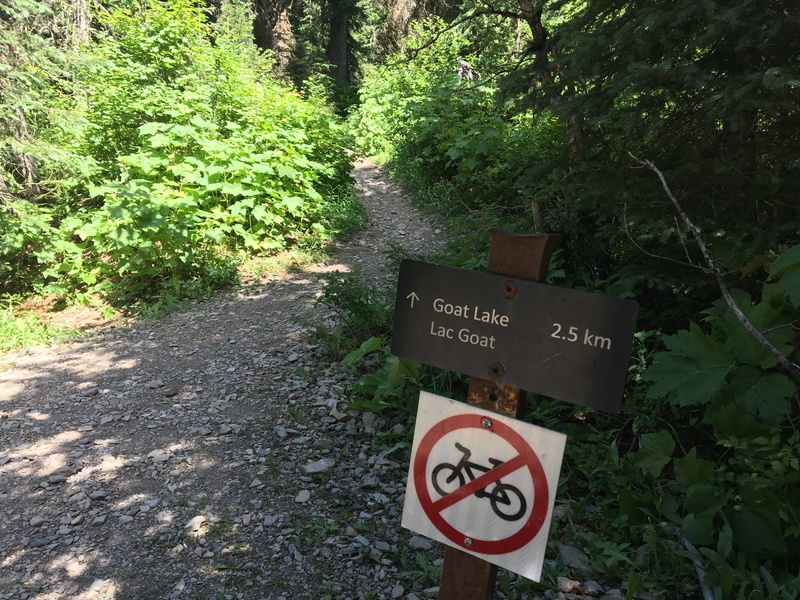 At 4.8km there’s a sign directing you north to Goat Lake. After the junction, the steep climbing begins. Initially, there’s not much to see. 1.8km from the junction, you start to break from the trees and the traverse comes into view. 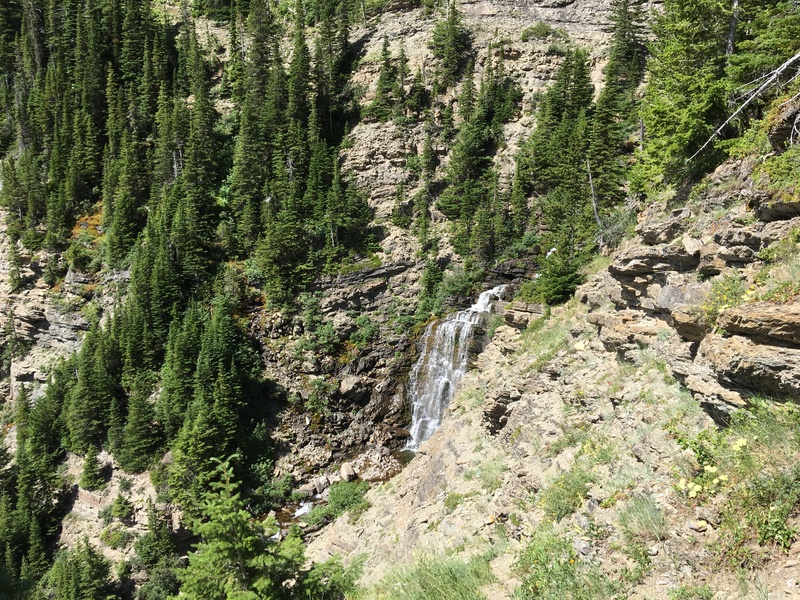 A switchback takes you up to the level of the traverse and gives a nice view of the entire height of the waterfall. 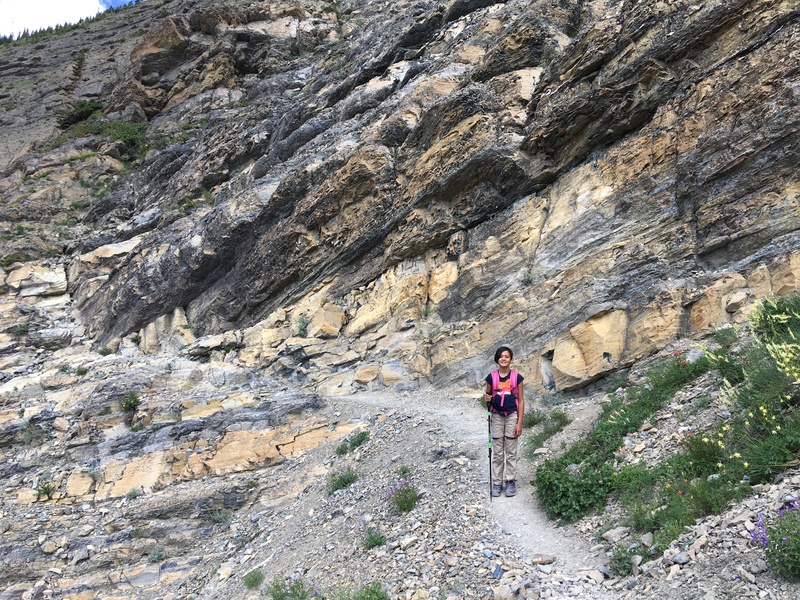 There are intriguing grey and yellow strata visible along the traverse. The real fun is on the traverse. At the end of the traverse, where the 2nd set of switchbacks begin, there’s a little side trail that leads to this view of the waterfall. Looking back, you can see the trail quite clearly. At the top of the second set of switchbacks you head back into the shade under the trees, following the stream toward the lake. There are a few picturesque mini-waterfalls as you approach the lake. Goat Lake, with Avion Ridge above. 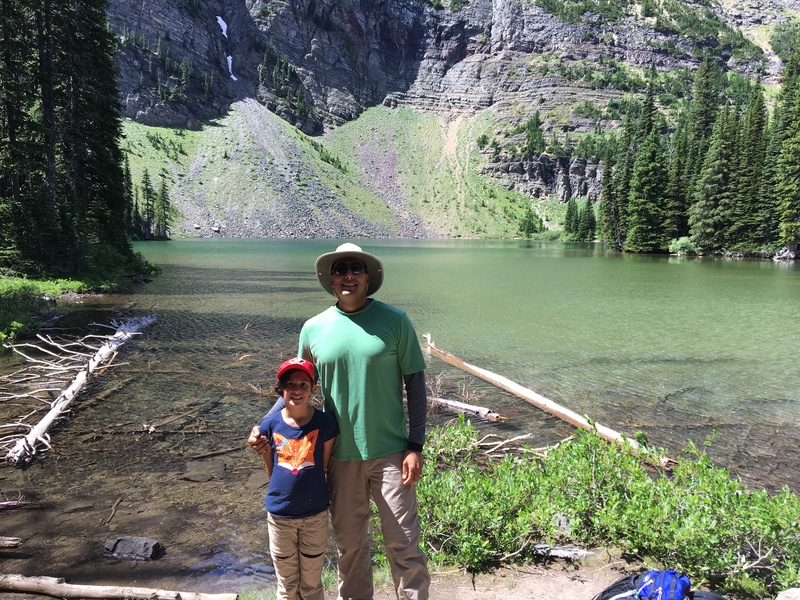 My daughter and I on the shores of Goat Lake.